I decided to get a little too honest with the title of this post. I had every intention of starting this semester on the right foot, never staying late, spending time working on hobbies and things I love, and then last Monday hit and I felt like there was no way I would ever get through my to-do list. I stayed late almost every day and never really made it through what I needed to as new concerns and issues pilled up. By Friday, I was thinking that every goal I set for myself this semester was just an out of reach dream, how had I forgotten how demanding and taxing teaching is? How did I forget all the little stuff that pops up each day that has to be handled? I was tired. I was frustrated. I felt like a failure. It isn't that the goals that I set for this semester are unachievable, it is that I thought I could just waltz into my classroom and they would magically all happen for me without any thought or planning. As crazy as it might sound to plan each prep ahead of time, for me, it is vital to ensuring I get done what I need to. This also makes it easier when something unexpected pops up. While you might be thinking that having every minute planned out makes it impossible to deal with the unexpected for me it ends up being just the opposite. When I know how I plan to use my time it is easier to make adjustments to those plans that don't take away from my personal goals, whereas when I don't have a plan, I usually give up time I scheduled for me to finish getting through my list of school demands. But that is exactly where burnout happens. 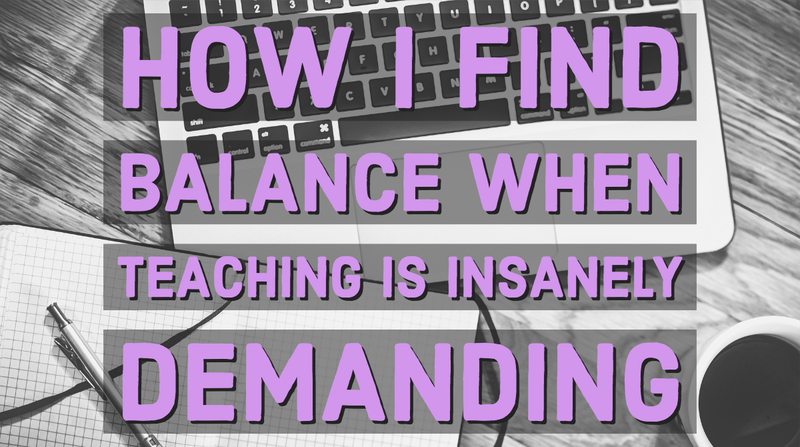 When I make teaching the number one priority, so much so that things that I do for my health and well-being can be trampled by the needs of teaching, I start to burn out. And when I don't have my week planned out that is when it becomes easier for me to say "I don't need to hit the gym right now, I'll stay and deal with X because when else will I be able to get to it." Because that is how teaching makes you feel, the work we are doing is so vitally important that we often times feel like we have to give ourselves to the practice but that thinking is destructive and in the end, it doesn't make you a better teacher, it just makes you tired. 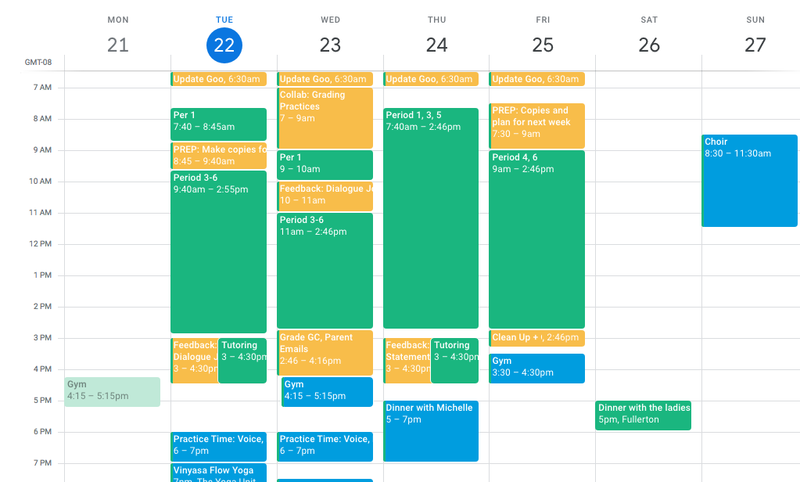 When I can visually see my week in detail it is easier for me to find the places where I can add more to my to-do list without taking away from the time I have built for me. Looking at my schedule right now, I know I don't need my full two hours on Friday to complete those tasks, so if something comes up I can add it to that list of things I need to do during that time instead of taking away from time for me. And if something comes up, I will physically add it to my goals for that time. There are still a thousand little things that come up throughout the week that need to be handled, emails you reply to during lunch, student questions and concerns, parent emails, admin requests, but for me it is easier to find a place for those when I have a clear picture of what my week looks like. When the expected is planned out in detail the unexpected is easier to tackle. This is the method that works best for me but I'd love to know, what do you do that helps you find your balance? Tell me in the comments or on Twitter.